Summary: This is book 5 of the Throne of Glass series. Spoiler warning for all the previous books in effect. If you would like to read all my previous TOG reviews (as well as all other SJ Maas reviews), click here. 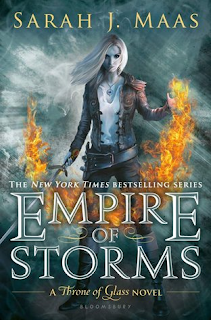 Aelin Galathynius is returning to Terrasen to claim her throne, raise an army, and defeat the evil demon king that has been threatening Erilea for centuries. But things aren't going to be easy - with enemies amassing all over and around the continent, Aelin also has to deal with new dark creatures hunting her, long-dead royalty sending her on dangerous quests, and her responsibilities towards her dearest loved ones, who have sworn to fight by her side. With the continent descending into chaos, new friends, old friends, new enemies, and old enemies all come into play as Aelin pushes the limits of her fire magic and prepares for a war at a price that only she can pay. Thoughts: After all the events of the previous book, Queen of Shadows, I expected that EOS would take things up a notch, and IT DEFINITELY DID. And because SJM fans know that she has no qualms about making her beloved characters (and by extension, her readers) suffer, there were definitely many passages that I read with a hand over my mouth or with a clenched fist because I wasn't sure if everyone would make it out alive. And LOTS of old "friends" show up in this book. If you haven't read all the prequel novellas (conveniently packaged into one volume as Assassin's Blade), it would be a good idea to read them before you read this. I mean, you don't HAVE to, but it's good to know the backstories for these other characters that will show up in this one. How DARE she ALSO end this book with our beloved heroine being in the hands of her enemies, separated from her fae mate??????????? This is how ACOMAF ended tooooooooo!!!! I cannot handle you doing this TWICE to me in one calendar year, Maas!!!!!!!! OH MY GOD. And now I have to WAIT and WAIT and WAIT to see our beloved lovers in BOTH books reunite (eventually). Go read this now. I need someone to commiserate with. Seriously. Dying here. My life has been reduced to this, waiting and ACHING for the next Sarah J. Maas novel.